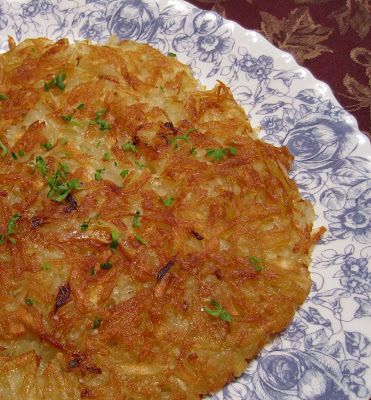 Simply put, this is a big (the size of a frying pan) Jewish latke(s), also Belarusian dranik(i), Ukranian derun(i), German Kartoffelpuffer, and Swiss Roesti. I looked this recipe up on one of cooking shows and decided to give it a try. Alex was wandering around kitchen and whining that it would not work out. Boy, was he wrong. It turned out so good! If you like potato pancakes, but do not like the hustle of cooking them, this recipe is for you. Put the slillet with oil on medium to high heat. Grate potatoes.You have to work quickly with grated potatoes to prevent oxidation when it turns brown. So, quickly squize grated potatoes with your hands, to get rid of some of the liquid, grate onion, add salt and pepper and mix well. Put all potato mass on the hot skillet and spread evenly, cover with lid and let it brown nicely on one side. Here comes the main trick: remove lid, put a plate on the skillet and turn potatoes over onto the plate, browned side up. Then carefully slide potatoes back on the skillet, trying not to destroy the perfect round, and brown the other side. When potatoes are soft when pierced with a fork, place the pancake on a big dish and cut like you would cut a cake, in wegdes. Serve with sour cream, greens, fresh cucumbers and tomatoes. Is your mouth watering yet?..